Aren’t we all? It’s Valentine’s Day and consumers are said to have spent over 300 million on chocolate over the past week. Three…hundred…million. That’s 58 million pounds of chocolate! That’s A LOT of chocolate! But being a chocolate lover myself, I can’t say that I’m all that surprised. Over the past month I have been to two popular Portland events centered around the sweet treat we call chocolate. From the normal chocolate to the not-so-normal chocolate, I have seen it all. Some of the more unusual chocolate creations were the chocolate covered bacon and the blue cheese chocolate truffles. 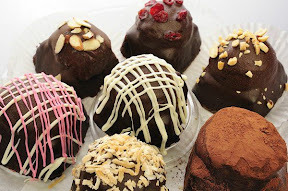 I didn’t try the truffles because I’m a little weirded out by the combination but it seemed to be a hit at the Chocolate Festival so maybe I’m missing out? The bacon was surprisingly good but not good enough to spend $6 on a few small pieces. 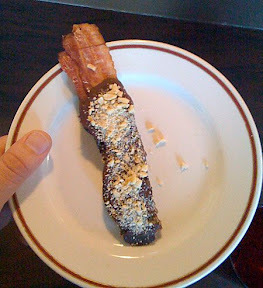 Still thinking about that chocolate covered bacon? One local blogger has revealed to me that you may be able to find this unusual dessert at the Belmont Station. You’d think we’d be spent out after forking over 300 million on chocolate treats but that number only accounts for a small portion of the 3.5 BILLION dollars American’s are expected to spend this year on Valentine’s day. Whatever you’re doing today, I hope you have a wonderful Valentine’s Day! And eat some chocolate.